Getting There: The journey begins with a pick up at your hotel or in San Ignacio at 7:30AM with a 40 minutes’ drive on the George Price highway until reaching the junction of the Humming Bird Highway. This is the highway leading to southern Belize and passing by the newly relocated capital city of Belize, Belmopan City. The journey on the Humming Bird Highway is another 15 minutes to the Blue Hole National Park where the cave is situated. At the site: After checking in with the park ranger, we proceed onto gearing up while your guide briefs you on safety procedures and historical facts. We then follow our guide as we start of on a 45 minutes’ hike through the forest until arriving at the cave’s entrance. 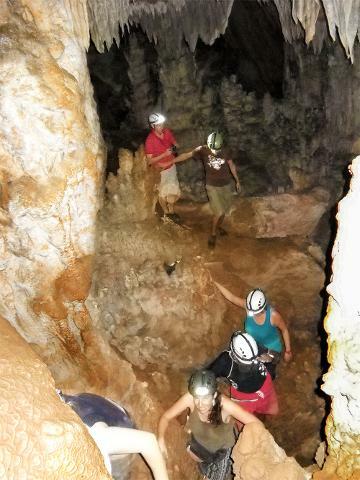 Here, our guide will take you on a journey into the past, following the footsteps of the ancient shamans as they traversed into the Mayan underworld “Xilbalba”. To enter the cave, there’s the option of rappelling 30 ft. downward or climbing down using natural hand holes & pockets in the limestone. These ancient rock formations, seemingly glittered in diamonds, will amaze you. This cave has been named one of the 10 best caves in the world by the National Speleological Society. This cave will leave you wonder-struck with its huge cavers adorned with beautiful stalactites & stalagmites, flow stones, rock columns, crystalline formations & Maya artifacts. Witness age-old evidence of rituals & ceremonies such as potteries, beads, fire pits, charcoal ash & skeletal remains calcified in the limestone floor. Crystal Cave Exploration puts you up close and personal with unique cave formations and the phenomenon of crystal caves which have formed over centuries. This adventure offers a bedazzling thrill for the explorer in you. Departure: After 3+ hours of cave exploration we head back out of the cave and back to the parking lot. Here we have the option of stopping at the Blue Hole for a refreshing dip. This blue hole is not to be confused with Belize Great Blue Hole which lies offshore at Lighthouse Caye. This inland Blue Hole is a sapphire-colored pool at the bottom of the cenote which was formed by the collapse of an underground limestone cave. From here, we head back on our journey onto San Ignacio town, arriving around 4:00PM. What to Bring: Hiking boots, long light pants, lightweight T-shirt, change of clothes, towels, sunscreen, water, insect repellant, camera. Provided: We provide you with helmet with head lamp and life vest if needed. Note: This tour is considered challenging for the involvement of strenuous activities. Participants are expected to be able to hike, climb, or rappel. Not quite suitable for persons with prone to claustrophobia, back or leg injuries, or pregnant women.